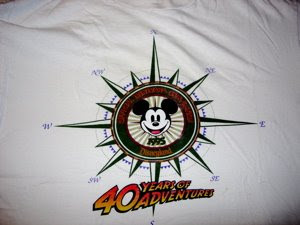 This is a t-shirt from the Official Disneyana Convention in 1995, celebrating Disneyland's "40 Years of Adventure". 1995 was the year that Disneyland opened the "Indiana Jones Adventure" ride in Adventureland. Today it is still one of the park's most popular rides. The Official Disneyana Convention was really awesome, and they offered a lot of good merchandise in the "Indiana Jones" theming. 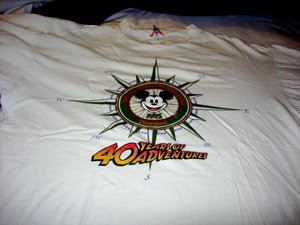 Although I have been wearing this t-shirt ever since I bought it in 1995, it is still in pretty good condition.